A blogger and website developer can only earn good revenue from a website or blog while they are using a advertising Network and in the list of the top advertising networks Google AdSense stands at the first position because Google AdSense is biggest advertisement network with millions of publishers and advertisers. Google adsense is available for all the website owners but they have a huge list of terms and condition and if your website complete and complies with all those terms and conditions then you can get Google AdSense approval but this is not so easy. A lot of the marketing experts has revealed several ways to get Google AdSense approval but this is also very difficult to get Google AdSense approval after those tricks and tips so to earn sufficient revenue with the website I suggest you to use Google AdSense alternative for good revenue with a website. 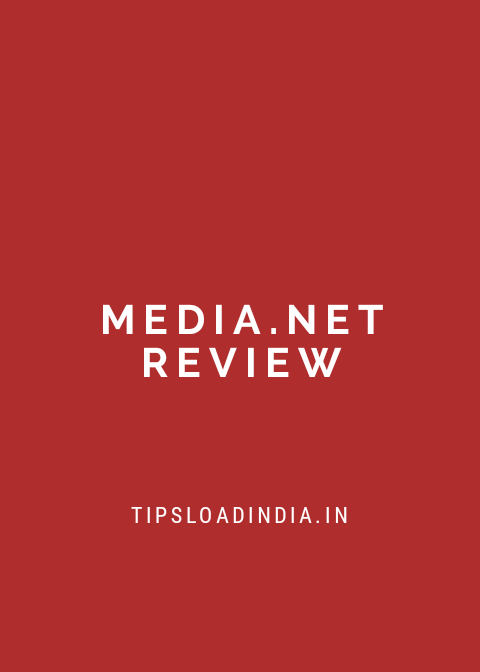 I am talking about media.net ( a best Google AdSense alternative ), media.net is a advertising network which is introduced by yahoo & bing search engines. If we compare this network with google AdSense and other advertising platforms than this network get second position just after google AdSense. I am not saying that this is much better than google AdSense, I also use google AdSense because they are the best in advertising community along with, media.net is best in some of this field, if we compare Google AdSense and media.net than we can't decide the one because both are the best in their work. AdSense is giving revenue as CPM and CPC method and media.net is only use cpm. We will talk about media.net in brief in this article, I am also using media.net along with google AdSense so lets discuss about media.net performance and specifications. Media.net is a combined advertising program from bing and yahoo so this is a authentic platform for website monetization. Media.net is a good network in comparison of Google AdSense because this is very easy to get approval with media.net . Media.net is accepting new publisher account so you can easily sign up on media.net from its official website. Here's a complete process to create a publisher account with media.net. Its very easy to create a publisher account On media.Net , you just have to follow these steps. • open media.net official website by Click here ( get extra 10% ravanue - if you register from here ). • now at homepage they will ask your for create a account so fill out details, they will ask you for your website details and your gmail. • after submission of these details they will ask you for your name and a simple question just complete this formality and go ahead. Now you will see a text message that they will contact with you in next two days, it means that if your website is just according to their terms and conditions then they will send you your account information or if not than they will tell you reason for disapproval , you can submit your application unlimited times until you got the approval. But this is not difficult to get publisher account approval with media.net. If your website have these qualities than they will approve your request in first try. • media.net is popular and mostly used in USA , UK and Canada so they prefer those websites which are getting most of the visitors from these countries so we can say that this is a term for getting media.net account, you should target the audience of these countries for getting approval with media.net. • website is only approved on media.net when they have a top level domain they are not accepting website with blogspot or WordPress sub domain. • media.net is giving approval to those website who are in English, it means that if your website is primarily in English than they will approve your website. • sufficient content is also a requirement of media.net , if you have 25 posts on your website than you can get media.net account approval. 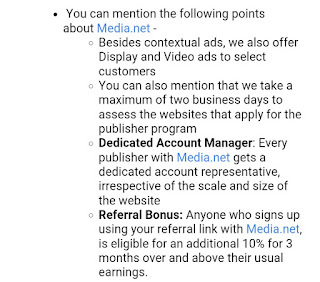 These are the only requirements to get a media.net account as a publisher. If you have two websites than you have to get separate approvals for both websites, this is just different to Google adsense. Media.net is based on CPM advertising method it means that this network will give you your earning as according to the Impressions, CPM means cost per impression when your website is getting Impressions at media.net advertisements then you will get payment with media.net you don't have to wait for any clicks on advertisements for earning, this is a major difference between Google AdSense and media.net. AdSense is primarily based on CPC method which means that they will give you your earning while your website visitor click on their ads. Media.net offers you a variety of designs and ad sizes as according to your website placement, you can create your preferable ad unit for your website under ad units Section at media.net dashboard. Text ads are the backbone of media.net advertising, media.net will show high quality text ads for better CPC and CPM , text ads are popular in all advertising networks because this can increase your clicks on ads. Video ads - media.net also offer video ads along with text ads , this ad program is only offered to selected publishers of media.net , if your website perform well with media.net ads than they will unlock this feature to your website, video ads is a better way to increase earning of a website. Ad sizes - this is fact that sizes of ad banner are also very effective in website revenue, choosing a right ad size can attract more visitors to ads , and this will increase your CPC. Media.net is offering you several ad sizes you can select any of them to get better earning, but I suggest you to use ad units which are provided by your account manager at the time of account creation. Ad colour - you can adjust colours of ad units in media.net, I suggest you to match your website theme colours with ad units to get better CPM , this is a hidden method to increase your earning with media.net. 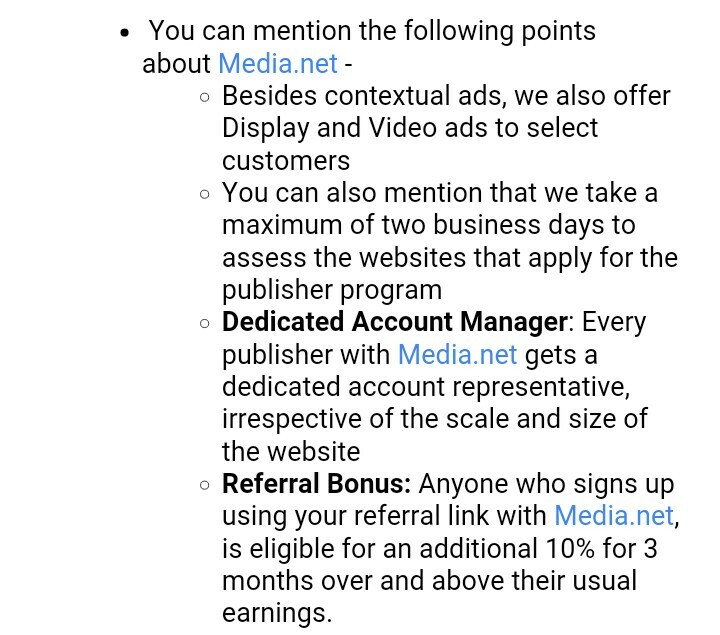 Media.net is paying to its publisher in several ways if you use media.net for website monetization than they can pay you with PayPal, payoneer and direct wire transfer you can choose any payment method to withdraw your money, media.ney works on net30 method it means that they will request a payout on every 30th of the month. Most important question is its minimum threshold amount, this network will pay you when you have a minimum of $100 in your account. This is available for all countries so they will charge some fees for money transfer in bank ( outside USA ). 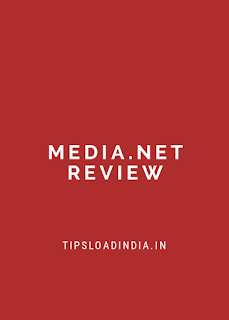 Media.net is a fabulous advertising network and this is the true competitive of google AdSense , this is CPM based ad network and if you are getting low CPM with media.net account than you can try these tips to get better ravanue from your website. Choosing a right ad size and place for ad unit on page is very important for good earning so I suggest you to use mostly use and high impression places for media.net ad unit , these are the some best ad places for your site. Placing more ads on same page is a good way to increase impressions but not good for earning , use only 3 media.net ad units on a single page for good earning. As I mentioned above about popular ad sizes. Attract more traffic from big countries like USA , Canada, and UK for high CPM rates, this is most popular and easy way to multiply your earning with media.net. Both are the best performers in advertising network field but their are some big differences between google AdSense and media.net, let's take a look at step by step compression between media.net & google AdSense . There is a big difference between Google AdSense and media.net in registration process if we compare both advertising networks then we got that media.net is very comfortable for Publishers because midea.net is offering a publisher account with only some little conditions but at another side terms and conditions of Google AdSense for a publisher account are very typical so small publisher can't fulfill the all requirements for Google AdSense account approval. Contact service can increase brand value but google AdSense is just doing opposite of this because their is not any easy and fast contact service for small publishers, but media.net is winning in this field because they have a very strong contact service network, each and every publisher have a personal account manager for solutions of all problems and queries, AdSense have not any customer care network but they have a lot of articles and written solutions for mostly asked questions. This is truly important thing for comparison , both are highly advance advertising network but there is a difference between working method of both websites because media.net is work on the basis of CPM and Google AdSense works on CPC method it means that Google AdSense will give you money for Clicks on advertisements but media.net will give you money for Impressions on the advertisements. So I think that media.net is better than Google AdSense because you don't have to wait for Clicks on advertisements for earning. payoneer and wire transfer but google AdSense can only transfer your money into bank account, you don't have choices for payment while using Google AdSense. Media.net is not only a genuine and original advertising network but also this is supporting contaxctual advertising which is very popular way to show advertisements related to your content if you use media.net for monetization of a website then they will show targeted advertisements related to your content and keywords for example if you are writing articles on cameras then they will recognise these keywords and show related advertisements to camera which will increase your Cpm and Earning with a website. Is media.net is true alternative of google AdSense ? This is a common question in the mind of all small Publishers because media.net is a real competitive of Google AdSense so this is difficult to choose one of them, as you also experience that there are a lot Of advertising networks are available on the web but only few of them, when we talk about media.net then we can use this advertising network without any doubt because this is 100% authentic advertising network which pays real money to its publisher I have mentioned some specifications of media.net which are better than Google AdSense I am truly satisfied with media.net performance on my website and using this advertising network for last 6 months and getting sufficient income with limited impressions. I am impressed with these qualities of media.net. • Personal account manager for troubleshoot. • contextual ad design with high quality. • high CPM rates with limited traffic. • easy payout at net 30 basis. Media.net ambassador program for selected publishers. This is the thing which is different from Google AdSense, this program is only available for few selected media.net publishers, with the help of media.net ambassador program we can share our referral link with other bloggers through our article and if they join media.net through that referral link than both you and he will be rewarded. 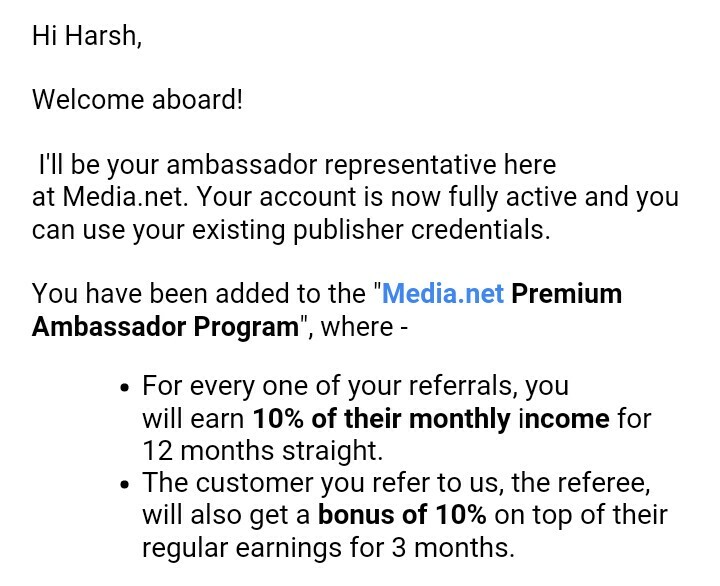 If any body join media.net using your referral link than you will get 10% of his earning for next 12 months and the person who join media.net will get 10% extra revenue for next 3 months. Their is not any where to apply for media.net Ambassador program because this is only for if you selected media.net publishers if you have got media.net approval for your website and you are doing best with your website then they will manually contact with you and tell you about this program. They will provide you a link from which you can login into your Ambassador program account and then you can get your referral link. 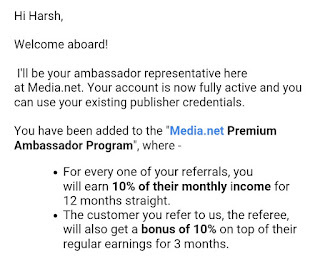 There is not any criteria to be selected for this Ambassador program from media.net this is a automatic process which is done by media.net executives. The new publisher of media.net have a doubt " is media.net really pays to its publishers ? " 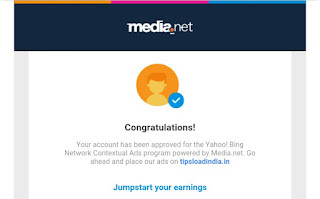 if you are also one of them then here's a earning proof with media.net, as I already mentioned that I am using media.net for last 6 month and I'm getting a sufficient income with media.net advertisements I am using AdSense with media.net advertisements if you use media.net then you can Doubles your income.